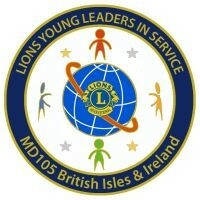 The Lions Club of Alton is an active participant in the ‘Lions Young Leaders in Service Award’ (LYLSA) scheme, which is part of the Lions Opportunities for Youth initiative. The LYLSA recognises volunteer community service by young people, between the ages of 11-18 years old, within a 12-month period. There is a Bronze Seal Award, Silver Seal Award and a Gold Seal Award and each Lions Club may recognise as many young people as are eligible. The benefits for young people taking part will include the experience of the rewards of community service, achievement of significant levels of community involvement and receive a congratulation letter, a certificate and awards presentation for youth recipients. The Community will also benefit as it will improve as a result of the young people’s service efforts and it will become more aware of service opportunities and nurture ongoing service by young people and others. 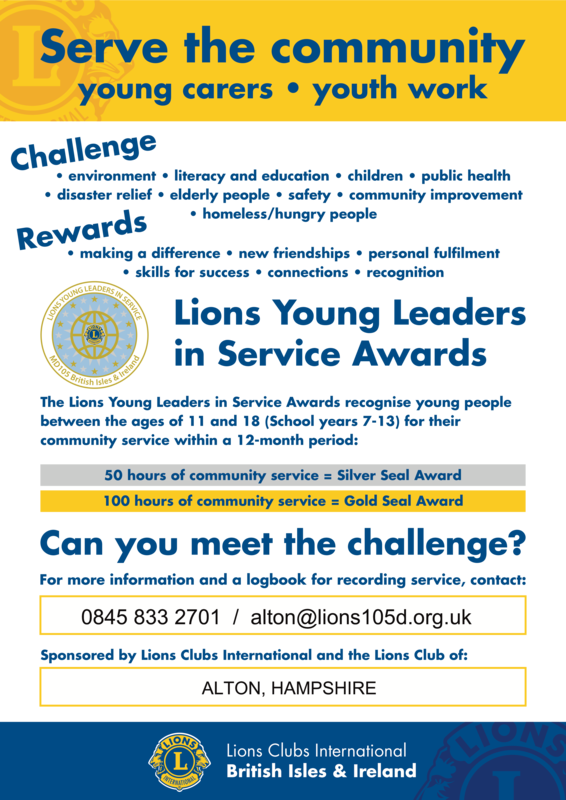 As part of the project Alton Lions will encourage people to serve the community, introduce young people to future service and leadership opportunities and provide on-going mentoring and assistance throughout the process. The Silver Seal Award is available for 50 hours of service in a 12-month period and the Gold Seal Award for 100 hours of service. There is also a Bronze Seal Award for 25 hours of service to allow for Young Leaders with limited abilities. Each qualifying young person is then presented with a certificate, usually at a special event, and the certificate can be included in his or her personal Record of Achievement File. Service with community or religious organizations, agencies, institutions or the Lions club. Service through school-based groups or courses. Individual efforts to help others and improve the community. Each young person will be provided with a logbook in which to record his or her service activities. A log sheet is completed and signed off by a responsible adult. This can be a teacher, youth leader or someone similar. These activities are in a number of different categories – all the hours can be from the same activity or from a variety of services. Categories include service to the young, the elderly, family members and the homeless and hungry. It could also include protecting our environment. Young people may also wish to assist their local Leos or Lions club in fundraising or Lions community service activities. All these activities count as hours towards the award.